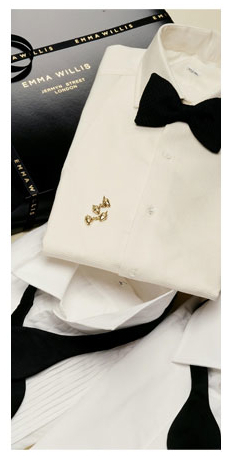 Wing-collar shirts are flimsy things unless made in the detachable, collar-stud traditional manner. When attached to the shirt, the collar is inevitably too low and lacks the stiffness of the starched original. Precious few shirtmakers make a good detachable collar today anyway. So your options are a plain turndown collar on a shirt with a pleated or piqué cotton front. Some glamour can come from studs, but it is rarely worth investing in these until you’ve got to the age that black tie events rarely lead to you being disreputably drunk in the small hours of the morning. I would make two alternative suggestions: silk and ivory. This struck me during a conversation with Emma Willis recently. The shirtmaker has come a long way since she set up on Jermyn Street and brought some much-needed feminine glamour to the industry. The shop still has a distinct sensuality, a feeling of being swathed in Sea Island cotton and shod in cashmere stockings. But the company has moved on to establish its own shirtmaking facilities in Gloucester, and Emma tells lovely tales about the seamstresses there. 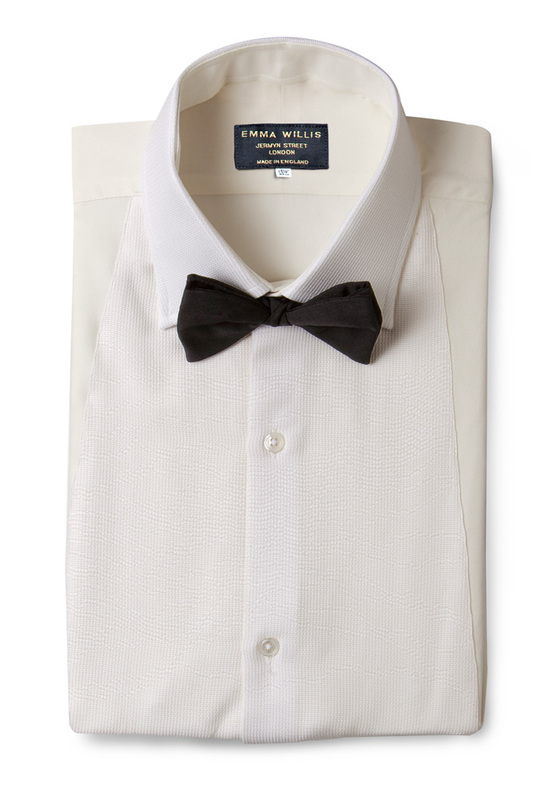 That conversation came round to black tie and a ivory silk shirt that was hanging prominently in the store. Now, this is not the silk of your 1980s imagination. It is not satin and certainly not sateen. It is sand-washed silk, which has a soft and textured handle. The shirt itself has a flat-turning bib front in silk pique and little mother of pearl buttons on a removable band so the shirt can be worn with studs (if you’re old and sober enough). And its ivory is a distinct off-white. Some traditionally minded men swear by cream or ivory shirts as an alternative to white. So much kinder on the complexion. I’ve never bought that: for me, pure white has the necessary crispness of corporate business, something cream never can. But with black tie – particularly, perhaps, with my brown and black velvet jacket from Timothy Everest – it has an attractive air of old-world decadence. Its tone stands out immediately from the cheap, flimsy white collars around it. The contrast is not dissimilar to that between black and midnight blue in the tux itself. One final piece of advice from Emma to conclude: if you’re going to have a pleated front, look for sufficient overlap of the pleats; a cheap, machine-made front will have larger gaps between each one, and quickly make the shirt look cheap. Good ones are sewn on individually by hand. You can follow the discussion on Silk evening shirts at Emma Willis by entering your email address in the box below. You will then receive an email every time a new comment is added. These will also contain a link to a page where you can stop the alerts, and remove all of your related data from the site. Nice post. I have never completely understood the difference between the types of formal dress shirts. Is there a difference in formality betweeen a pique shirt and a pleated shirt? When would one be chosen over the other? Would you ever see a shirt that is a pique fabric with pleats? Thanks. Pique is more formal than pleated. Pique would originally be shaped to fit the hole left by a waistcoat, so should really only be worn with that shape waistcoat (or a DB, at the worst). Pleats covered the whole jacket opening and therefore didn’t need to have a waistcoat, and were naturally more casual. The Black Tie Guide on this kind of thing is very good online. Cream versus white etc. Corporate? Not traditionally. The point was that white was never worn in the day, it being associated with certain trades or professions – airline pilots, chauffeurs, security guards etc. Many older and indeed younger men still avoid white, except in the evening, white being considered either boring or naff. How would you rate her quality compared to Budd and T&A? hey Simon Im looking to make a bespoke silk shirt. Do you know what mills produce a good quality silk. Ideally Id like a prewashed silk so it holds through washing process? haha yes I know what you mean as only women these days wear shiny silky shirt fabric (I don’t think its silk usually but some kind of rayon which is popularly used). its a pain to wash as well and expensive to boot. do you think I should try Zepheyr instead ? Not sure if thats how you spell. This is for very smart evening wear (not necessarily a tux but dark suit in evening at formalish events).